The ECR available in 2 sizes (10/10 or 10/16) offers all of the best features of our original Converta Rack design in a furniture style cabinet. Perfect for houses of worship, schools, corporate meeting rooms or any venue where A/V equipment must suit the decor. Constructed of 3/4" cherry or walnut melamine. The units have room for 10 or 16 spaces of rack equipment respectively in the lower section while our exclusive ratchet system supports 10 additional spaces on top. The locking, smoked lexan front door provides the perfect blend of security and visibility. Covering the mixer section is a key-lockable panel that retracts on heavy-duty cabinet sliders and lays flat against the rear of the rack. 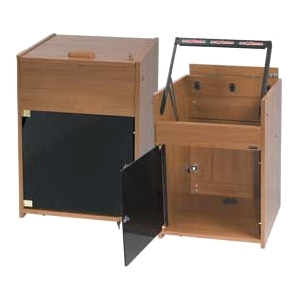 The locking rear door features breakaway hinges for easy equipment installation and maintenance. Passages in the bottom of the rack allow for easy cable management. All hardware is brass plated to compliment the attractive cherry or walnut finish. Rack is 21" deep and ships assembled.